In Southern Humboldt, the tips of the tallest trees on earth reach for the sky and often find the sunshine. From the Avenue of the Giants to the Southern Humboldt border, ancient redwoods define the landscape and create a magical environment all their own. You see, it’s often sunny in Southern Humboldt and the majesty of the redwood forests combine with the hospitable climes that grace these parts most of the year. Behind what is affectionately known as the Redwood Curtain, the visitor has plenty of options for fun and frolic. Rivers and an ocean await and, with them, hiking, boating, fishing, swimming, surfing, sailing, all ready to be enjoyed. The mystique and wonderland of this region beckon and await. 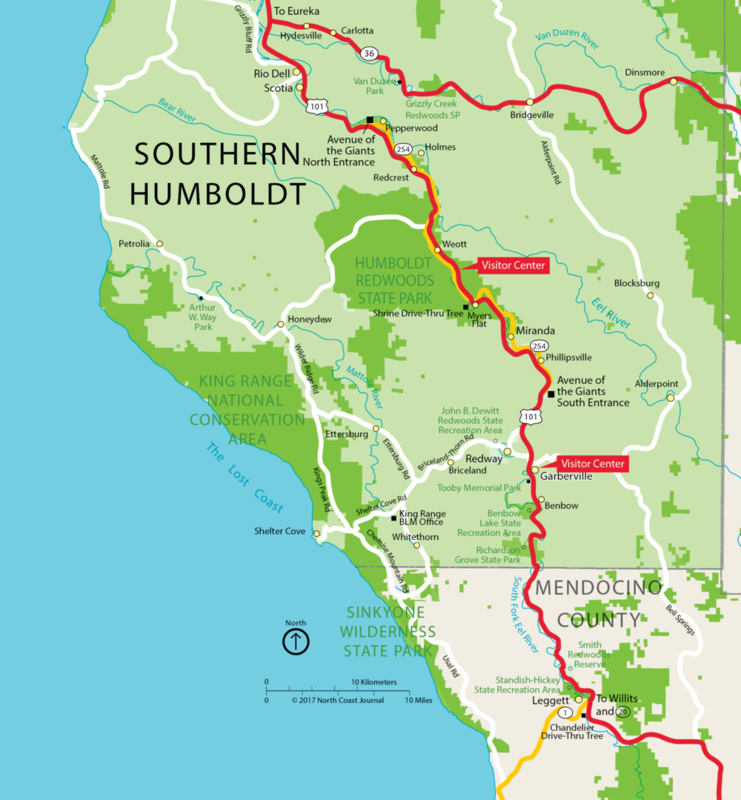 We welcome one and all to come take in the jaw-dropping beauty that makes Southern Humboldt a can’t miss destination on anyone’s bucket list. The unincorporated town of Garberville is located on the South Fork of the Eel River and is 15 minutes from Humboldt Redwoods State Park and a hop skip and a jump from the Avenue the Giants. Behind the Redwood Curtain, Garberville has thrived as a center of activity for farmers and related merchants for more than a century. The town enjoys sunshine and a bustling downtown with local shops and eateries. Garberville town is a gateway to the Avenue of the Giants and Shelter Cove and the Lost Coast. Old buildings along the main street are being renovated, and the town is getting a face lift. New boutiques, restaurants, and watering holes are opening, as the whole area is going through a metamorphosis. Taller than a 30-story building. Wider than two Cadillacs bumper to bumper. As heavy as an army of elephants. These are just a few descriptions of some of the world’s tallest, widest and heaviest trees. Coast Redwoods (Sequoia sempervirens) line the Avenue of the Giants and visitors are greeted with an awe-inspiring experience. This aptly named 31.6-mile scenic highway stretches from just north of Garberville and continues through Scotia, providing the motorist with an up-close and personal experience with the ancient redwoods that line the Avenue. There are plenty of places to pull over and gawk, and redwood groves to stroll through. There are quaint small towns with shops featuring redwood art, artifacts and trinkets. Experience Humboldt Redwoods State Park containing the Rockefeller Forest, the world’s largest contiguous old-growth forest of coast redwoods. The Avenue of the Giants is an adventure that everyone should experience. It is akin to other natural wonders of the world and accessible year-round. The First stop along the avenue North of Garberville, Phillipsville offers The Chimney Tree a historical insight into the hardiness of ancient redwood trees featuring a 12½-foot diameter room carved from the center (which was burned out in 1914, according to its carved sign of tree stats). Inside, visitors can gaze up “the chimney” 78 feet to the hole where the rest of the tree once continued. The “living” part is technically correct, because redwoods are fierce survivors of fire and other indignities, spawning new offshoots, stalwart branches and trees. Continuing along, Miranda offers a quaint slice of life and is a great stop for the traveler with lodging, a full service gas and grocery, shops that feature redwood arts and crafts, and dining … a perfect place to stretch your legs and to stock up on provisions. One of the long time and most popular attractions on the Avenue is the Shrine Drive Thru-Tree. This is a can’t miss photo op and a memory waiting to happen. Myers Flat also offers a general store and RV parks and historic lodging opportunites. The site of Humboldt Redwoods State Park Visitor Center. Weott offers spectacular camping and pays homage to one of nature’s most ferocious feats of power … flooding. Recent history is shaped by two major floods. In December of 1955, lower Weott was partially destroyed when the South Fork of the Eel River overflowed its banks. The town was largely re-built but In December of 1964 a Pineapple Express, a rare weather phenomenon, created the greatest flood in the recorded history of California’s North Coast. Look carefully at redwoods along the Avenue of the Giants: The trees are marked by the high-water line from a flood in 1964. The history of the Avenue is on full display in Red Crest with shopping, camping, RV parking and camping, along with attractions that give insight into the magnificence of the redwood forest. Gem of the Lost Coast — where the King Range meets the Pacific Ocean: That’s Shelter Cove! Besides the continuous “ahh” moments of stunning Pacific Ocean views, there is much to offer the visitor. For the sportsman, there’s world-famous salmon, cod and halibut fishing. You can charter a boat or launch your own. Set out a crab pot or two offshore and pull up delicious Dungeness crab. Perhaps collect abalone and mussels off the rocks or dig for clams. How about board and body surfing, kayaking, diving and paddle boarding? Explore tide pools, hunt for sea shells, observe sea lions, harbor seals and a multitude of birds, and enjoy a colorful sunrise or sunset. Whale watching is a favorite pastime with the best views from December to May. On shore there’s hiking and biking, or just taking a stroll on the striking black sand beaches. The Bureau of Land Management (BLM) provides beach access (Lost Coast Trail), parking and incredible views at Black Sand Beach Trailhead in addition to restrooms and interpretive panels. Staying over? Would you like an ocean front room? There’s plenty to choose from. Several vacation rentals are available around the Cove. For pilots, Shelter Cove offers a 3,400-foot runway. A nine hole golf course is available for the intrepid golfer. The community center includes Abalone Hall, 1,200 square feet of venue with a full kitchen available for rent, a bocce ball court, basketball hoop, a sports lawn for volleyball and croquet, and two horseshoe pits. (The District also provides horseshoes, bocce balls, basketballs, volleyballs, and croquet sets.) And don’t forget the playground across the parking lot from the fire station for the kids. A well-stocked general store has just about anything a picnicker, camper, hiker or fisherman might need. The RV park and campground is located in the heart of Shelter Cove, offering a mini-market, full deli, a music pavilion, pull-through RV sites and campsites. There's handy access to the boat launch area, Mal Coombs Park and the relocated Cape Mendocino Lighthouse. The lighthouse, originally situated 30 miles north was moved to the Cove and restored in 1998. Tours are available on summer weekends. Mal Coombs Park is managed by the BLM and provides paved parking, picnic tables, barbecues and restrooms. Barbecues and group picnic tables are available to be reserved for large gatherings by contacting BLM. Mal Coombs also provide easy beach and tide pool access via a set of sturdy stairs. The magnificent King Range National Conservation Area includes and surrounds the Cove. The King Range encompasses over 68,000 acres of public land that offers a diverse mix of recreation and wilderness opportunity including the Lost Coast Trail (part of the California Coastal Trail). Visitors to the King Range can hike to the summit of King Peak and look out over the ocean at 4,088 feet and ride their mountain bikes on the Paradise Royale and Pacific Rim Trails. Developed campgrounds for tent and trailer camping (less than 24 feet), interpretive trails and wildlife viewing areas complement the visitor's experience in the King Range. So many opportunities to explore the outdoors! The Lost Coast awaits and getting lost has never been more fun.